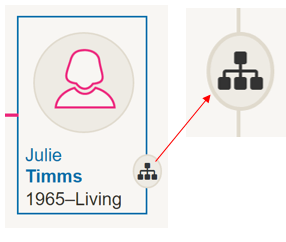 Located in the top right corner of your family tree, this icon lets you view all the details of your family tree. You can do things such as change the name of your tree, for example. The icon also provides a drop-down menu with lots of other resources. You can view all the media you've uploaded, all the places your ancestors are from, every fact you've added, the master sources or the main records used, repositories or the website where the tree is stored and, finally, a list of the people you've shared the tree with. Located next to the orange 'My Hints' button, this icon provides a short, informational video that explains the basics of starting a family tree. You can print your tree but only the the branch or part of the tree you are currently viewing on your screen. The pedigree view of the tree will let you print up to four generations at once but If you want to print the entire tree, you will need to export the GEDCOM file and take it to special family tree printing service. If your family tree is larger than the size of your computer screen, these icons will come in handy. They are navigation tools that allow you to cycle through different branches and generations of your tree. This button allows you to add family members to the parts of your tree that have gaps. 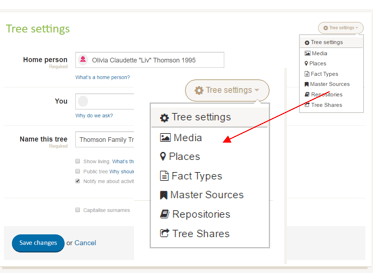 The button is usually connected to a family member that is already on your tree and by clicking it you will be able to add a relative to that family member. This one's pretty self-explanatory. It simply allows you to search within your family tree – particularly helpful if your tree is bigger than 20 family members. Click on the magnifying glass icon (shown above) and type in the name of your family member. Click on the search result and it will take you to that person's place on the tree. 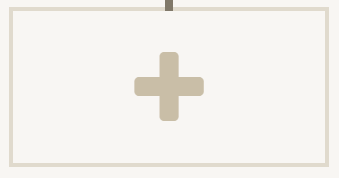 If this icon shows up next to an ancestor, this means that ancestor has a separate branch on the tree. It will usually be attached to a spouse of the current branch of the family tree (someone not related by blood) but could also be attached to a family member that was adopted, if you had details on their birth family. If you click the icon, it will lead you to that ancestor's branch of the family tree. Congrats! 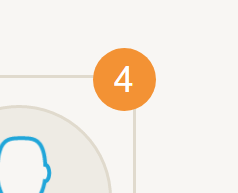 That's a hint notification. A hint is a potential record match or additional family member that have been found in our records. If you see a small number on your ancestor's profile, it refers to which number spouse they are. For example, if you have a female ancestor who divorced and then remarried, the number 1 will show up next to the first husband and then the number 2 will show up next to the second husband.